College coaches have thousands of athletes interested in their program each and every year. Being able to stand out from that crowd takes a great deal of dedication to the recruiting process. 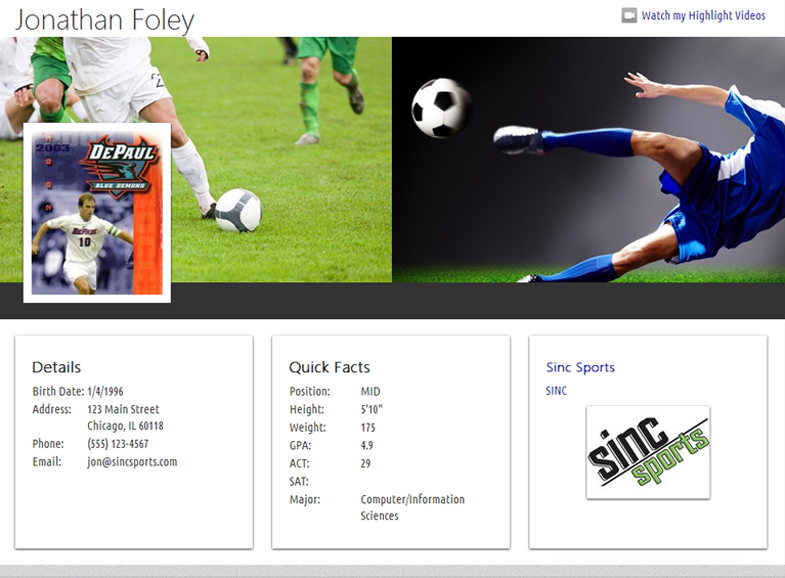 One of your first introductions to a college coach will be in the form of your online profile. With over a 1,000 programs and 5,000 coaches in our database, you know you'll be searching through the most extensive college database available. 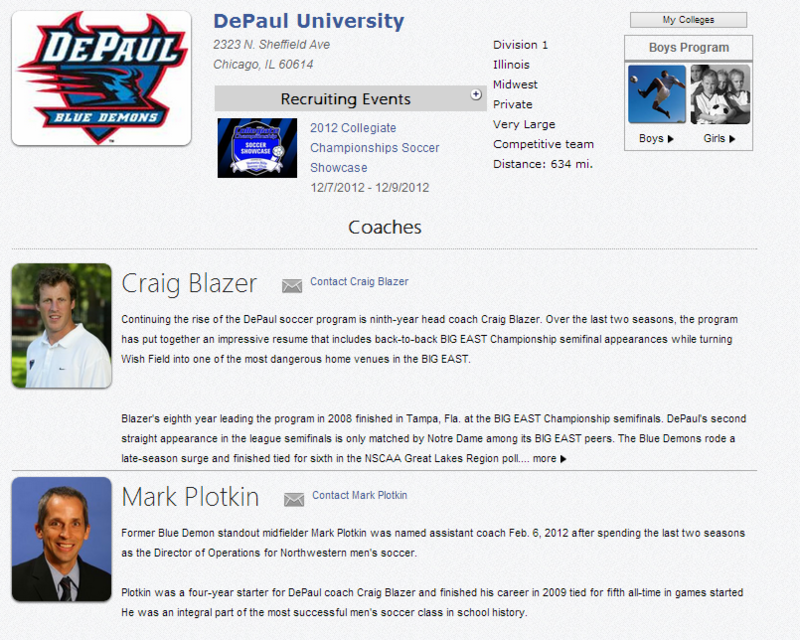 Find schools that match your criteria, reach college coach bios and contact coaches with the click of the mouse! A picture is truly worth a thousand words. While you're not going to be able to truly show off your capabilities as a player through a photo, a great action shot can make you stand out from the crowd. Upload some great action shots and we'll do the magic of transforming it in your very own slideshow. 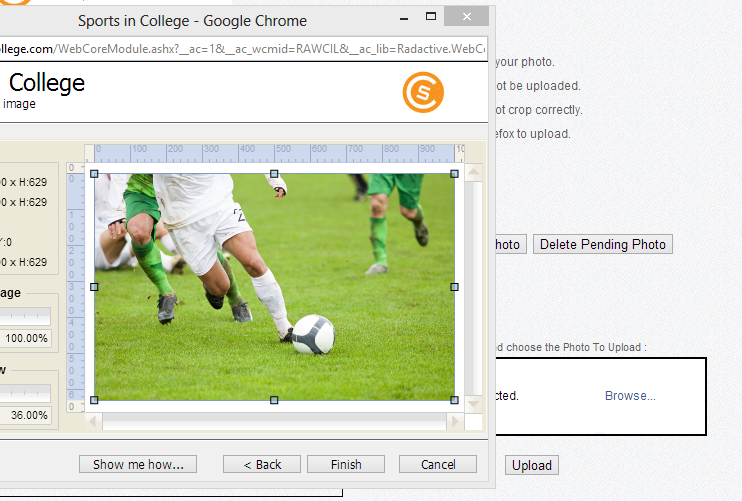 Simply browse for the file on your computer, crop it (if you'd like to) and click the button to upload. To REALLY make a great first impression, share a highlight video on your profile to give coaches a sneak peak of your skills. We work with a number of college showcases around the country bringing college coaches and athletes together. In 2013, we began offering video services at those showcases to give each athlete an opportunity to get a professionally made highlight video to share on their profile. 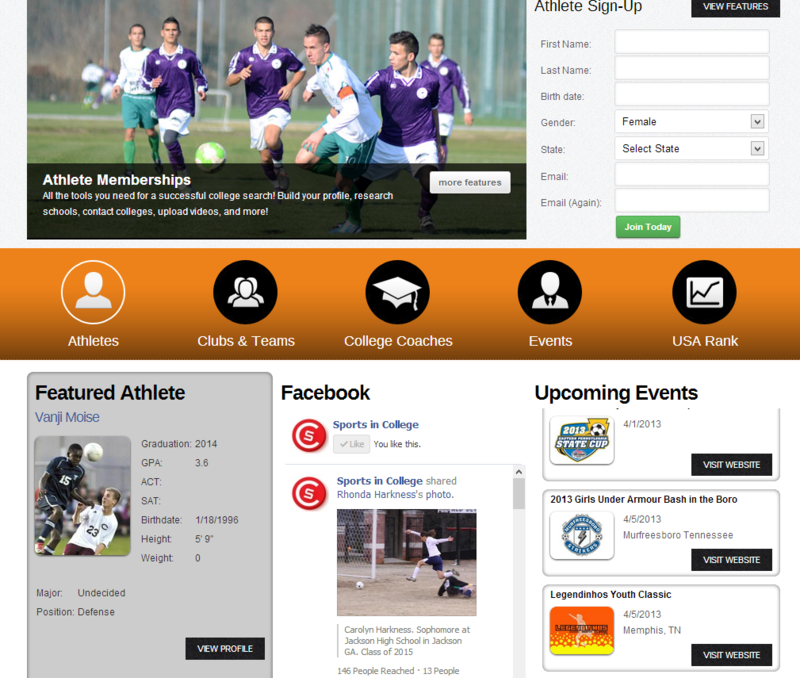 When you login to your SportsInCollege.com account, you will be taken directly to your control panel which will list links to important pages (your profile, colleges, etc) and will also list your Next Steps! In case you don't remember to login and keep active in the recruiting process, we will send you weekly emails to help keep you motivated and point you in the right direction! Our most important feature which makes us stand out from other companies out there is our SincLink system. Email communication these days is not enough. You send out a message to a coach, but have no way of knowing if it was ever received, read or even replied to. SincLink takes the guess work out of the communication process. College coaches have to juggle and navigate through many different tools and programs used by athletes. With SincLink, college coaches just reply to your email without having to visit our site to make it as easy on them as possible. 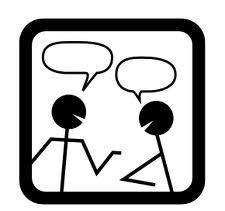 We receive the message, add it to your conversation, and notify you right away! Become a Featured Athlete on our home page! 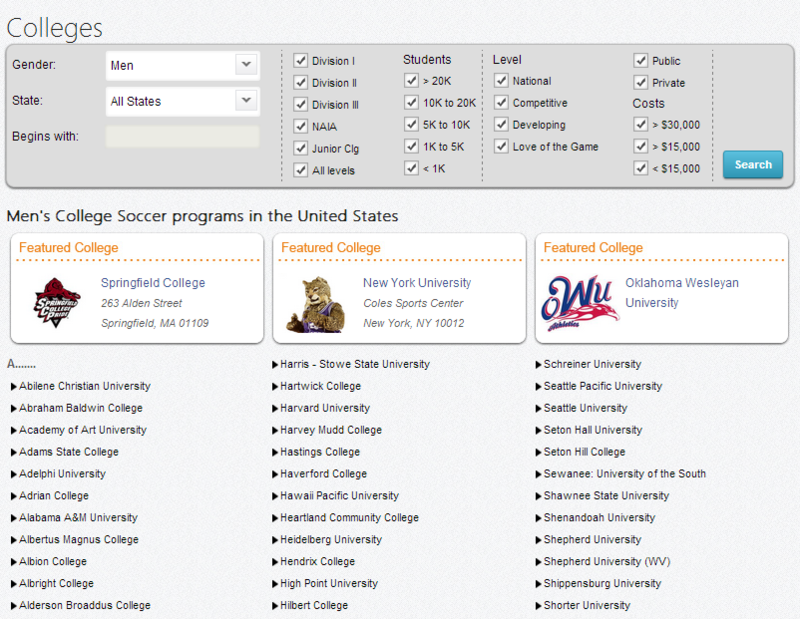 The SportsInCollege.com websites received over 45 Million views in 2012 and was visited by over 1,400 college coaches. 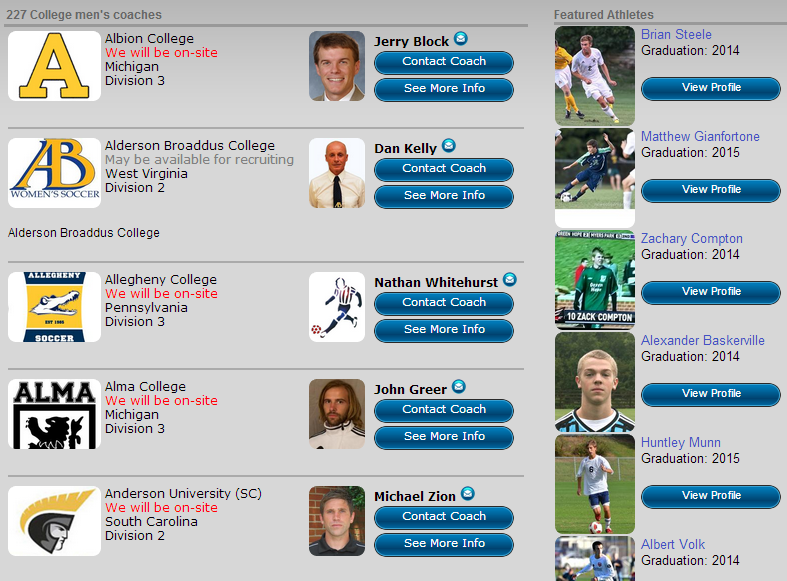 We want our athletes to get a chance to stand out to these coaches by featuring them on one of the most popular and visited soccer websites in the United States! If a college coach is registering for a showcase or just checking on some potential recruits, we want them to see you front and center when they visit our site! What's a SincWink? It might just be your ticket to college! 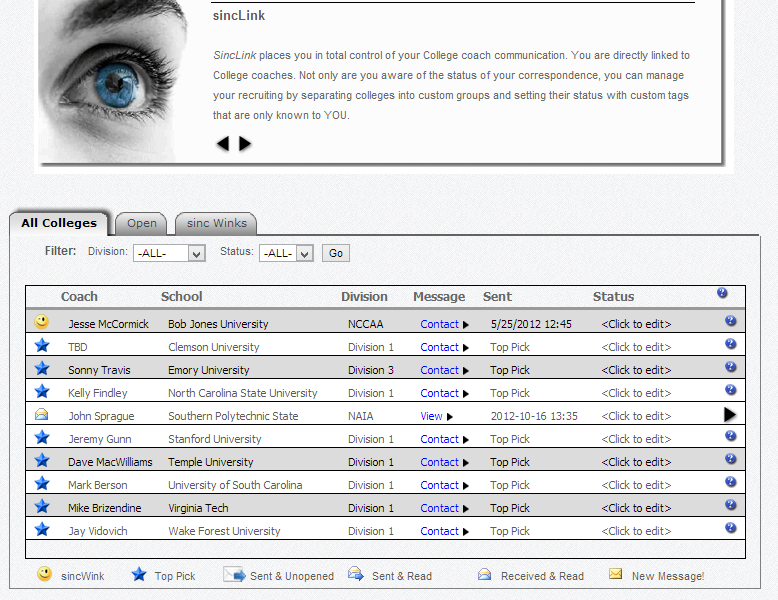 SincWinks are our way of letting you know a college coach is checking up on you. Whenever a college coach visits your profile, we will send you an email letting you know who it was and when they visited. We do this so you don't miss out any potential opportunities. Even if you are absolutely positive that you want to attend a certain school, getting noticed by another college might give you that chance to really explore all of your options. After all, you only get one chance to play college sports so do your research, find your perfect school and get to work! College showcases are such an important piece of the puzzle. While it is definitely not the only place to be seen by college coaches, it is definitely where many athletes catch a coach's eye. We'd love to be able to tell you that there is some big secret to this process and we are the only ones who can help you through it. Unfortunately, the only mystery is in the recruiting process: how it works, what to do and when to do it. 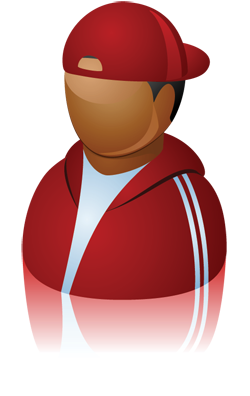 Enter....SportsInCollege.com! We have the knowlege of the recruiting process, the tools you need to get the job done, and the desire to help student athletes pursue their dreams! College Bound Athletes stand out to College Coaches! 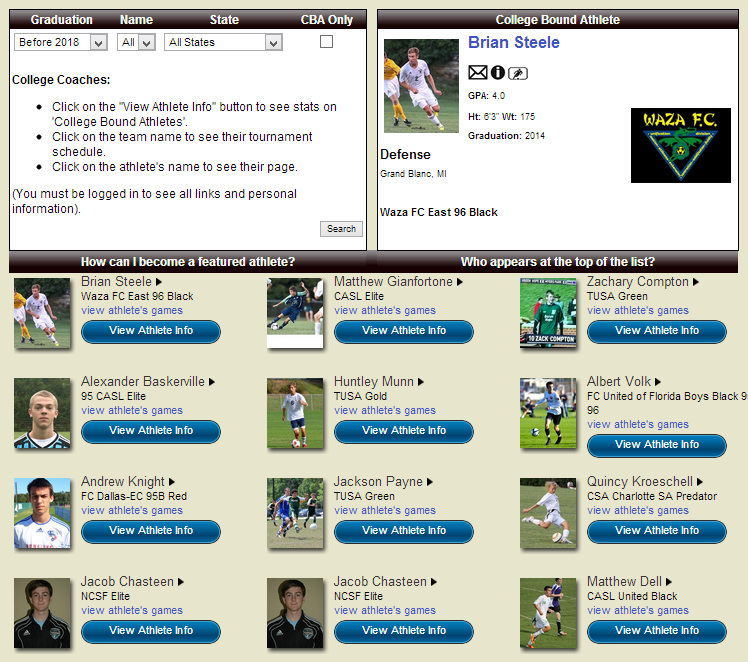 College Showcases using the SportsInCollege.com and SincSports.com platforms! Create your new Premier Plus Account!